Brief Synopsis –Two members of French High Society of the 18th Century make a bet to see if they can find a way to corrupt a young woman. My Take on it – This is a film that I saw years ago and wasn’t so enthralled with it, but upon rewatching it, I found that I enjoyed it so much more. This is largely due to the way that the two main characters are presented since they both are able to constantly scheme and manipulate everything and everyone around them in order to get what they desire even if it is solely for the satisfaction and fun of it all. 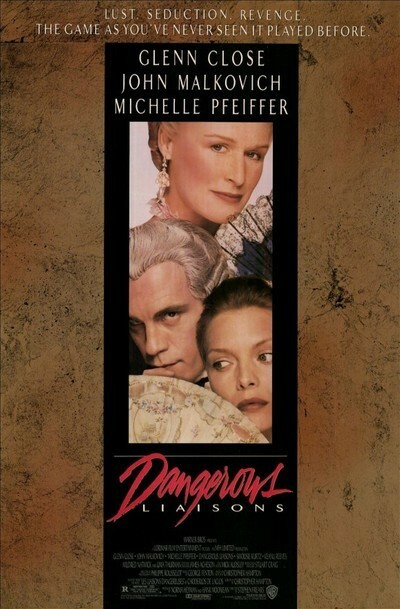 The cast is excellent here and John Malkovich, Glenn Close and Michelle Pfieffer are all great here. Having read that Alan Rickman originated the main role on stage makes me wish that he had been used here because he would probably be an even better Valmont than Malkovich. (see Trivia below). The story itself is presented as being quite timeless yet they perfectly chose to have it take place in the days after the French Revolution. The story is presented quite well and they manage to keep things mysterious and dangerous for the characters during their mind games since they can get caught at any given moment. The one drawback of this film is the fact that a few scenes drag along a bit but had they been edited a bit, this would have been an even better film. Bottom Line – Such a great film because the two main characters are so good at being able to do excessive scheming and manipulating to get what they want all for the fun of it. The cast is superb and Malkovich, Close and Pfieffer all shine here. I would love to have seen Rickman’s performance of the main role (see Trivia below) just to get a comparison. The story seems a bit timeless yet is perfectly placed in the days after the French Revolution. The story works really well and there is always a bit of mystery and danger in the games they play since they are quite often close to getting caught. Unfortunately parts of the story move along a bit too slowly which slightly takes away from making this film excellent. Recommended! Agree with most of your assessment here on this film. Where we don’t quite agree is on Rickman making a better Valmont than Malkovich. What impressed me so much about Malkovich’s performance was that in real life – he is not a classically handsome man. He is, in fact, a bit peculiar looking (as opposed to Rickman – who WAS quite striking looking and debonair). So the fact that based only on his self-assurance and his cockiness – and not his looks – Malkovich was able to convince me 100% that he had the ability and charm to seduce Michelle Pfeiffer as well as Glenn Close. It was an incredible performance – done with his voice and manner and cocksure ways. the fact that Malkovich was not even nominated for an Oscar (Close and Pfeiffer both received nominations) was one of the more egregious errors (IMO) the Academy Actors Branch ever made. Not only should he have been nominated – I think he should’ve won (over Kevin Kline in “A Fish Called Wanda”). If I recall correctly – he may have had an affair with Pfeiffer during production – and then broken her heart – and I always wondered if the other actors took it out on him by NOT nominating him. That being said – I DID see Rickman play the role – in London – (I also got to see him on Broadway in another play late in his life where he was excellent. He signed my Playbill after the NY performance) while I was there researching a film I was writing. I don’t remember any specifics, other than it was a very good production over all. I think my mind was elsewhere – and not focused on a play in the West End. And as a follow up – a week after the Oscars that year – I was having dinner at a small restaurant in Santa Monica – and my date and I were seated next to Michelle Pfeiffer – who was dining alone. The proprietor of the restaurant – commiserated with her on losing the Oscar (to Geena Davis in “The Accidental Tourist”) and in lieu of thee Oscar – presented her with some sort of porcelain pot that was on display inside. Michelle was very nice about it. Did not give an acceptance speech, but she did take it with her when she left after dinner.